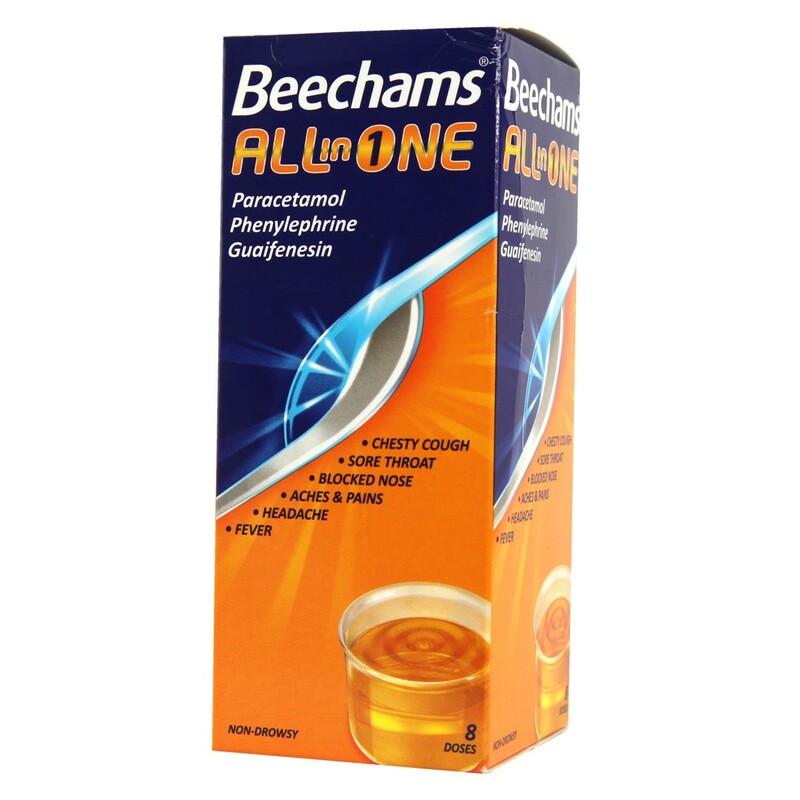 When looking for relief from your cold, nothing fights more symptoms than Beechams All-in-One. As well as paracetamol to relieve a headache, aches and pains, it also contains a decongestant to relieve catarrh and unblock your nose and sinuses and an expectorant to relieve chesty coughs. Each 20ml dose of syrup contains: Paracetamol Ph Eur 500mg; Guaiphenesin Ph Eur 200mg; Phenylephrine Hydrochloride Ph Eur 10mg.Also contains ethyl alcohol 19% v/v, propylene glycol, sorbitol, glycerol and colour (E110). Adults and children 12 years and over: Fill measure cup to 20ml mark and take one 20ml dose (four 5ml spoonfuls). repeat every 4 hours as necessary, but do not tkae more than 4 doses in any 24 hours. Do not give to children under 12 except on medical advic.You should make sure that you carefully read all product packaging and labels prior to use. Side EffectsRare, but skin rashes and other allergic effects can occur with paracetamol, upset tummy may occur with guaiphenesin, and a few reports of raised blood pressure, headache, dizziness, upset tummy(sickness and diarrhoea), difficulty with sleeping and palpitations occurring with phenylephrine. If you are concerned with any effect while taking Beechams All-In-One, stop taking the medicine and talk to your doctor or a pharmacist. Thank you for your interest in Beechams All - In - One Liquid. Enter your email and we'll contact you as soon as it's available again.